Our original honeymoon in 2013 was a washout….literally. We set off full of hope in our Skoda estate up to the Isle of Skye. 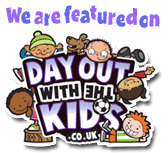 We had planned to spend the week climbing, bivvying out and generally exploring. Yes, obviously we hadn’t given much thought to the fact we were going to Scotland and not Spain! We had watched a DVD of Dave Birkett climbing in Skye in glorious sunshine and got a bit too inspired I think. Things weren’t looking good when we checked the 5 day forecast beforehand and realised we were in for a week of heavy rain and high winds. Not ideal when you want to spend your week climbing, and not ideal at all if you’re also sleeping in your car! We ended up spending 24 hours (including the 9 hour drive there and back!) in gale force winds and horizontal rain before admitting defeat and driving home. We spent the rest of our honeymoon climbing in the moderate rain back home instead. This year we had the opportunity to have another bash at a honeymoon when Craig’s sister and brother in law said they would look after the girls for a week in May, and my parents said they would look after our dog. We decided to upgrade our honeymoon and instead of going to Skye and sleeping in a Skoda (now sold) we were going to the Alps and sleeping in our van! 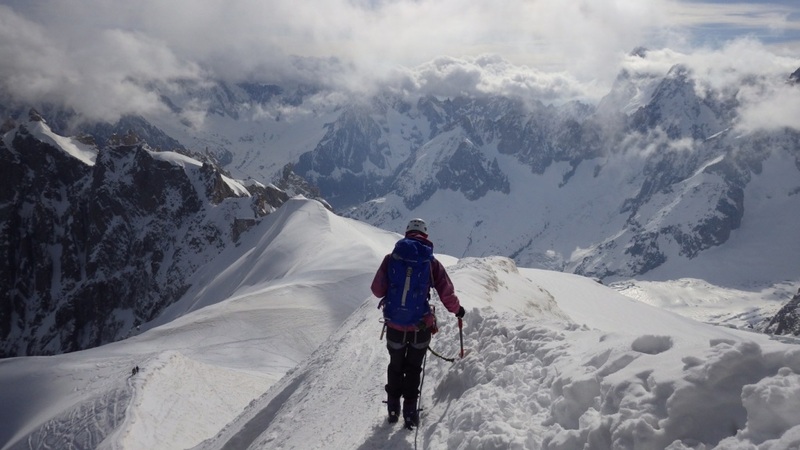 We thought we would head to Chamonix and take it from there. 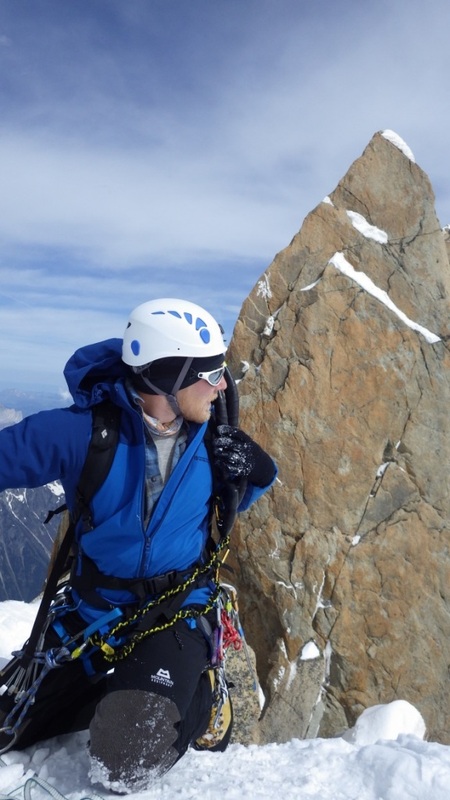 We bought some guide books and decided the main objective of our trip should be to climb the Cosmiques Arete on the Aiguille du Midi. We read about the route, watched videos on YouTube and tried to find out as much as we could about it. Craig bought a BMC video about alpine rescue and we spent our evenings trying out the different scenarios in the video all in the comfort of our living room. We also spent an entertaining afternoon prusiking up a tree outside our house (much to the amusement of dog walkers). 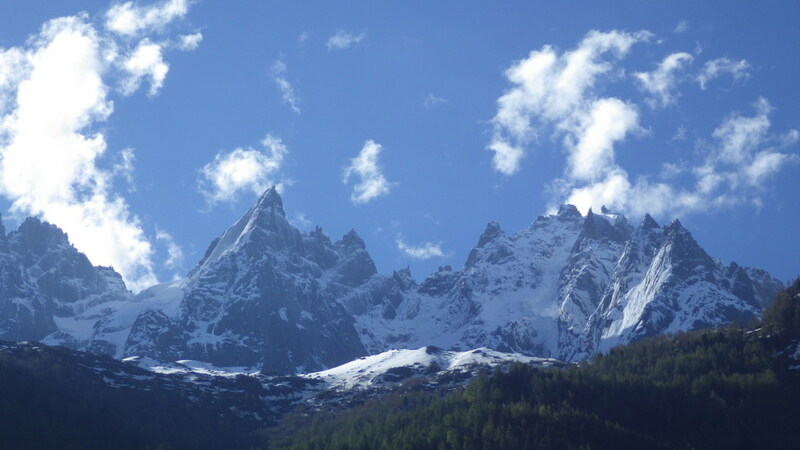 A week before the holiday we kept checking the weather reports for the Mont Blanc Massif range. After days of fantastic weather it was due to change right for us arriving with storms and heavy snow dominating the week. We couldn’t believe it. After all our planning, the chances of doing the route we had prepared for looked to be over. We talked about changing plans and going somewhere else before deciding we would just go anyway and possibly stick to low level rock climbs instead. We weren’t having much luck with the weather on our honeymoons! The morning of our holiday arrived! Michelle, Lee and baby Michael arrived at lunch time ready for their week with our girls. We set off full of excitement, before realising 5 minutes into the journey that we had left our travel insurance documents. Fairly important piece of paperwork when you’re doing what’s classed as a high risk sport abroad! A quick turnaround and search around the house for the said documents before leaving once more, this time with our insurance paperwork! We had to meet my parents at a junction 20 minutes from us so we could hand over Bear (our dog) then we were definitely ready for the road trip. Except what actually happened is we took a wrong turn and ended up miles away. A 20 minute journey ended up taking an hour and 15 minutes! Still nothing could go wrong now, all we had to do was catch the ferry and we were well on our way. Obviously we got stuck in numerous traffic jams all the way down and missed 2 ferries. Instead of getting the 8 pm ferry we had booked, we were just in time for the 1230 am ferry! We were so pleased to get on that as the ferries after that were fully booked well into the morning. We had a bit of luck at last. 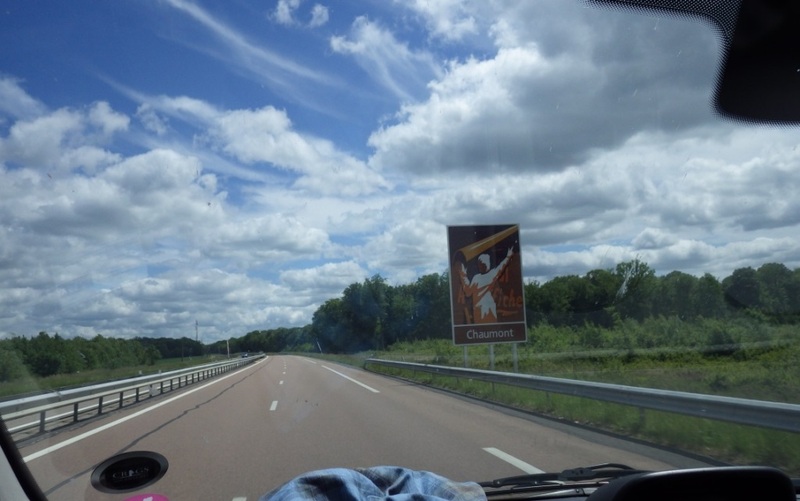 The journey to Chamonix went smoothly and we were happy to pay the tolls in France to experience a traffic jam free journey at last. Most of the filling stations were equipped with showers, so for a couple of euros we were able to have a daily shower where ever we went. We had a solar shower with us just in case though, but we only had to use it once (filled from a natural hot spring in Italy). We arrived in Chamonix around teatime and parked up near the cable car station. The plan was to acclimatise on a glacier, and for me to get used to walking in my new boots. We cooked some tea (does heating up a tin of chilli count as cooking?) and once again checked the weather. Craig said there seemed to be a chance of doing the route in the morning before the weather turned. We had until about 1.30pm to complete it in decent weather. He thought we should finish it in time if we got the first cable car up at 8 am. I was very apprehensive, I was concerned we wouldn’t be finished in time or the forecast would change again and we would get caught out. We went out to a local bar and shared a bottle of wine surrounded by mountaineering pictures and maps of the area. It’s amazing what alcohol can do but suddenly I was excited! 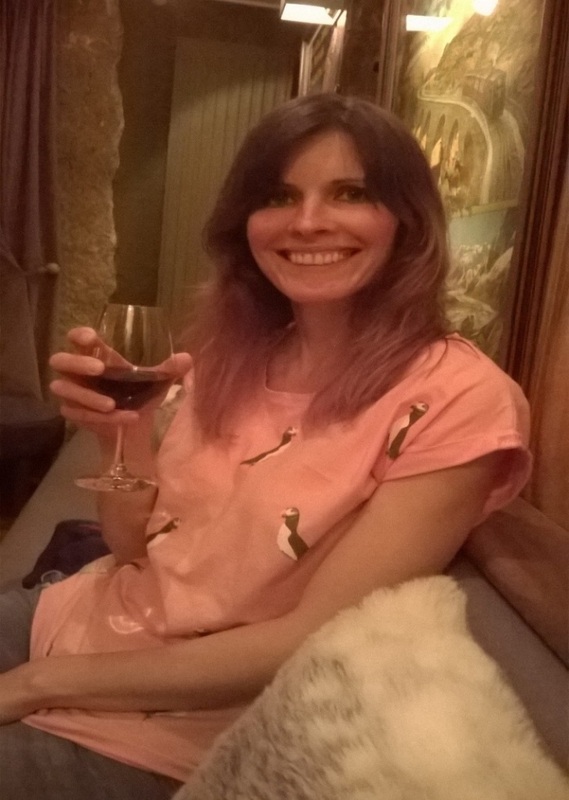 Fuelled by Red Wine – We Were Ready for Action! Morning arrived and we ate some Coco Pops for breakfast. I’m not sure if they are really recommended when you need something substantial to keep you going, but it was all we had and we didn’t have time to hang around for shops to open! We got ourselves ready in the comfort of the car park and walked the few minutes to the cable car. On arrival there was a mixture of skiers, guides with their customers and a couple of sightseers waiting for the first cable car of the day. We joined the queue and made our way on board. This is when I began to feel really sick with worry! The mountains are so impressive and huge you can’t help but feel intimidated by them when you see them up close for the first time. After about a 20 minute ride we had reached the top and exited the car. We stopped at the ice tunnel to get kitted up. 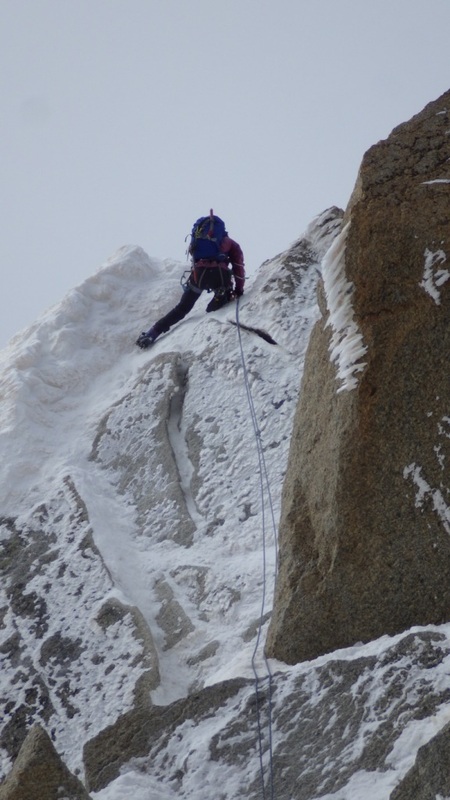 I was so nervous I was faffing on coiling the rope and taking an age to get my crampons on. By the time Craig had waited for me there was no sign of anyone else that had been sharing our cable car, except a small group of sightseers. There is a gift shop, cafe and museum up there so plenty for people to look around. As we were about to leave the safety of the ice tunnel and onto the ridge, the sightseers asked to have their pictures taken with us! 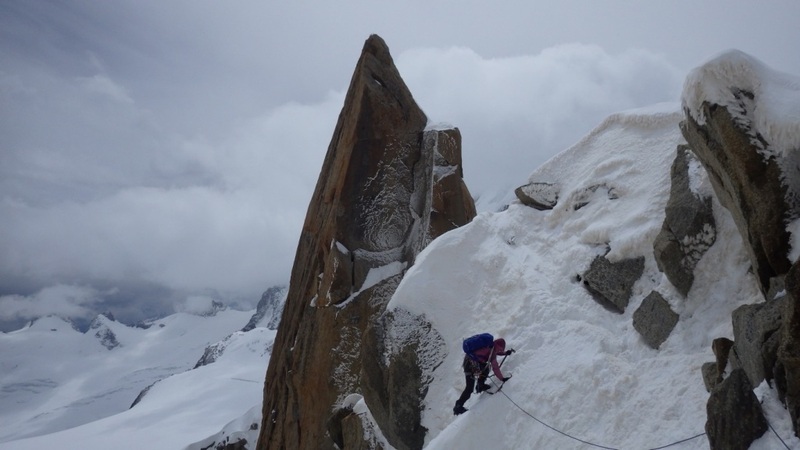 They obviously saw the professional way I was roping up before and presumed I was a seasoned mountaineer…..
As I took my first couple of steps onto the ridge I still felt like I might have a panic attack at any second. I was moving slowly due to my active imagination replaying me tripping up and going over the edge over and over! Craig was behind me, with our rope paid out between us. We stopped to look at the view a few times and take some pictures, it was amazing and there was no one in sight. The mountains were spectacular. As we travelled down the ridge and onto the flat we stopped to take our jackets off, it was warm and the skies were a bright blue with white fluffy clouds scattered around. As we trudged along I began to feel exceptionally unfit. My boots felt heavy, I felt queasy and I had to keep stopping for a breather. I kept hearing myself saying to Craig, “ I can’t do it, we’ll have to go back” but the words weren’t coming out. The voice kept repeating itself in my head until we reached the Simond hut. As soon as we stood at the hut the wind picked up around us and battered our faces. We both put our bags down and reached inside for our jackets. I told Craig how I felt exhausted and he said he didn’t feel that great either but it was just the altitude. I couldn’t believe I didn’t think of that but I think the combination of me panicking and wearing heavy boots and crampons that I wasn’t used to made me think I had just become massively unfit! I felt quietly relieved and we got our ice axes out ready for the ascent. As soon as we started to move together roped up I felt a hundred times better. I could focus on moving upwards. 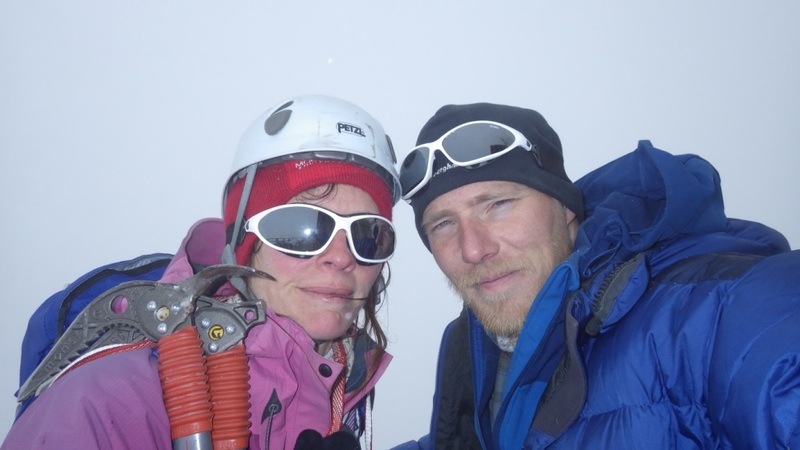 We continued moving together until the terrain became a bit more challenging and Craig led with me belaying him. Every time I was sat belaying I felt the nausea come back in waves. It wasn’t too bad though and seemed to subside when I was moving again. We came to the first abseil just in time to see a group of 3 finish it. At least we knew we were in the right spot! Craig abseiled first and shouted up when he was at the bottom. This abseil I didn’t particularly enjoy as I felt the exposure properly for the first time and I had to traverse to the right before descending. I joined Craig and made our way to the next abseil point. This time we both went face first before rotating on the way down as it was a squeeze to get turned around with rucksacks on at the top. This abseil flowed much quicker and wasn’t as scary for me. We continued on in pitches and noticed the weather seemed to be on the turn. The wind would pick up and menacing clouds would form before dispersing again. We knew we had until early afternoon to finish before it was going to completely crap out. 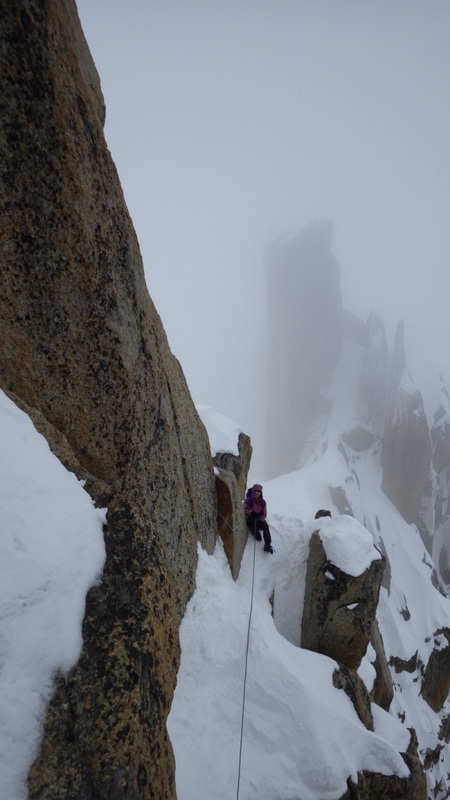 We arrived at the crux at the same time as a guide and his 2 clients. The crux was a short move onto a ledge, with holes for your crampon points having been drilled into the rock. 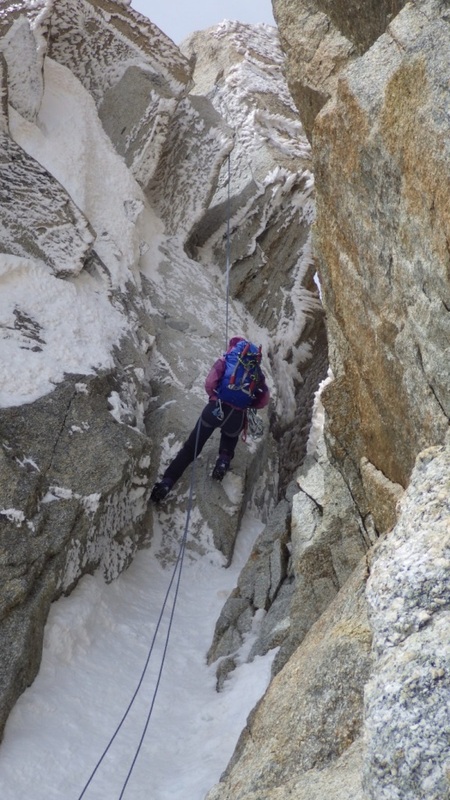 We both thought it was easy and didn’t feel like the crux with the rest of the route being in full winter conditions! Craig let the guide go ahead of us (or rather he just came barging past, with his clients crampons treading on our rope- not very British!). Although we were pleased to have done most the route alone it was also comforting to see someone as the weather was getting worse. We had a few sips of water whilst waiting for them to finish the pitch and wished we had eaten more than Coco Pops for breakfast! Although I wasn’t hungry, Craig was beginning to suffer and by the last pitch he looked in need for fuel. I watched him putting gear in, then re positioning it and shifting his position back and forth. I had never seen Craig behaving like this, even when he’s been on an E5 rock climb he’s usually very focused and confident so I was starting to get concerned. By this point another couple had appeared and were also waiting to climb this final pitch. Craig was resting his head on the rock; he seemed utterly exhausted and eventually hauled himself over the rock. He slowly moved up until he was no longer visible. I turned around and could no longer see the mountains; there was a grey mist everywhere. I chatted to the man waiting next to me who had done this route previously in better conditions. He said it felt like a Scottish winter grade 5 today. The time ticked on and I began to wonder if Craig was in serious difficulty. The rope would be static for an age before I needed to pay it out a bit. The rope had been slowly getting fed out until there was hardly any left and we thought we heard a very faint shout. There was no response after shouting back (not surprising as I’m quiet at the best of times!) so I took him off belay and began to move. As the rope was getting pulled in I definitely knew he was belaying me which was a relief! The rock that Craig was struggling with was something he could have done with his eyes shut in normal situations, but I was just thankful I could climb it after watching him. I really enjoyed this final pitch out of the whole climb. 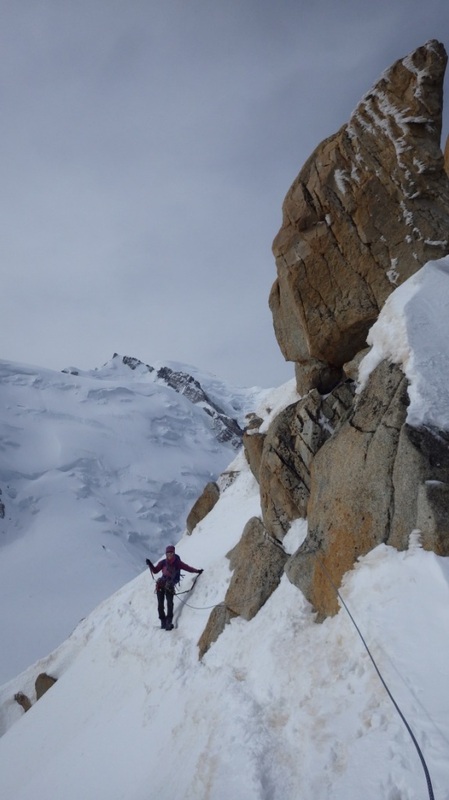 It was mixed terrain that I hadn’t climbed before but I loved using a combination of my ice axes on the snow, or a crampon spike on the rock. I just wanted to get up as fast as I could and noticed the man that had been waiting with me had set off as soon as I got over the first bit of rock. I didn’t know how long I’d be climbing but the menacing weather spurred me into getting up sharp! ….Not today! I looked to my right and could just make out a solitary cable car making its way down the mountain. I had to walk across a final ridge to the ladders. 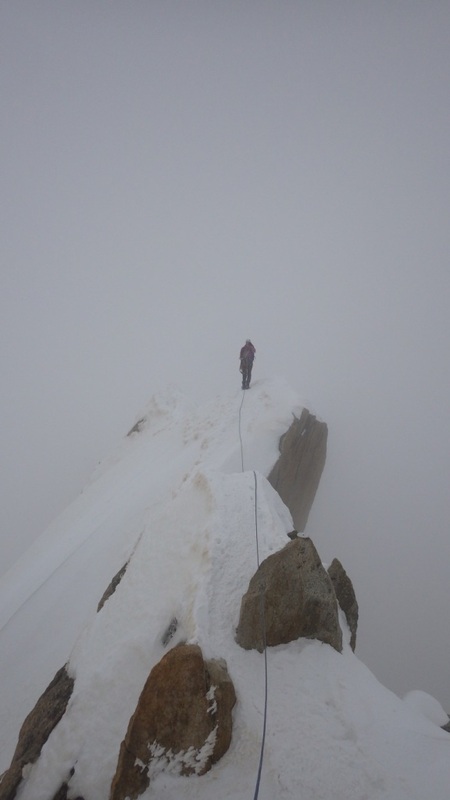 I moved slowly as I didn’t fancy plummeting a rope lengths into the mist, plus I was knackered. I climbed up the ladders and celebrated with Craig on the viewing station, safe at last! He had been so exhausted on the final pitch due to lack of food, altitude and the sheer responsibility of keeping us alive that he said he could hardly move. We were chatting and laughing about it all when I tried the door of the viewing platform. It was locked, I couldn’t open it. Craig tried it, it was definitely locked shut. Laughter turned to panic, “I’m not staying out here! !” I looked up and seriously thought we would have to start to traverse across until we reached the cable car. “I’m getting the door open, I’m not climbing anymore!” and with that Craig tried bashing the door handle along with his ice axe. After a few swift heavy blows the bolt flew across and the door opened. I have never been so happy to get inside a grey metal building in all my life! We tried to run down the stairs but we could hardly walk so we looked like a pair of 90 year olds hobbling along. It was a very surreal experience finishing a climb like that then ending up walking through a gift shop. Still, we bought a few bits of tat before heading to the cable car. The museum I said I wanted to look in pre climb didn’t seem appealing anymore as I just wanted to get back down! I was also convinced the cable cars were going to be stopped at any minute. I took my goggles off whilst waiting for the cable car and realised I really should of worn sunblock, the panda look doesn’t really suit me. We hauled ourselves into the cable car, along with a couple of sightseers dressed in normal attire, and felt happy to be alive! 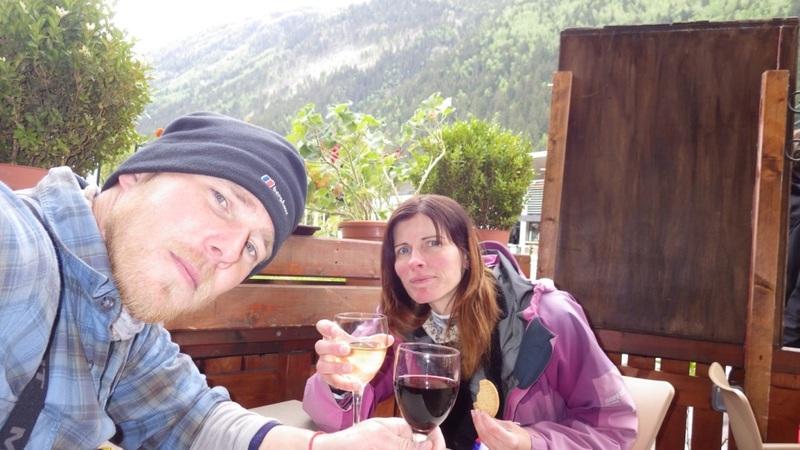 First stop out the cable car was to the café across the road for a wine and a massive packet of digestives. We later had a freezing cold shower in the Youth hostel at Chamonix which wasn’t the best end to the day but we were grateful they let us use it for free. 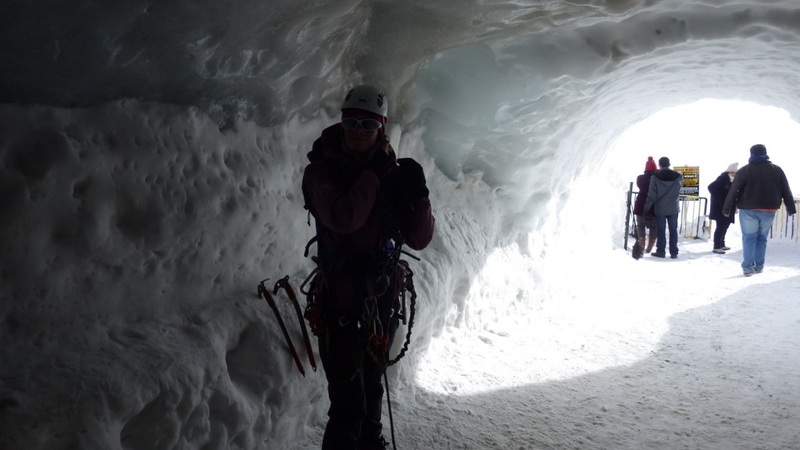 The rest of our honeymoon was spent visiting a glacier (the bit we should have done first) rock climbing in Italy, walking, reccying the Piz Badile, visiting friends plus adopting an Italian puppy for the night. A successful honeymoon at last, roll on part three! ← Truth & Balance: The key to living the dream?